Dulaang UP Theater holds open audition for a strong ensemble of MALE creators and performers on November 26, 2014, from 6pm to 9pm at Teatro Hermogenes Ylagan, 1/F, Faculty Center, UP Diliman, Quezon City. Registration starts at 5:30pm. 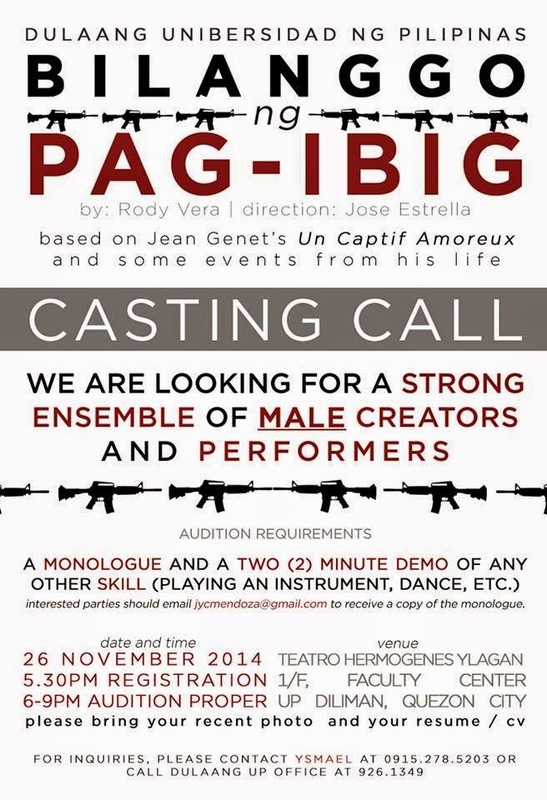 This is for the production, Bilanggo ng Pag-ibig written by Rody Vera & directed by Jose Estrella. For inquiries, contact YSMAEL at 09152785203 or call Dulaang UP Office at 9261349.